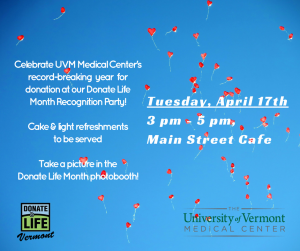 Donate Life Vermont | Celebrate UVM Medical Center’s Record Lifesaving Year on April 17th! April is Donate Life Month, which automatically means that it’s time to celebrate, but this year we have another special reason to celebrate! In 2017, the University of Vermont Medical Center had a record lifesaving year, facilitating more organ and tissue donors than ever before. Because of the amazing donor families that either said “yes” to donation or honored their loved one’s pre-declared wishes and the incredible hospital staff that helped support the donors and their families, 53 people received the gift of an organ transplant and hundreds more received tissue transplants. 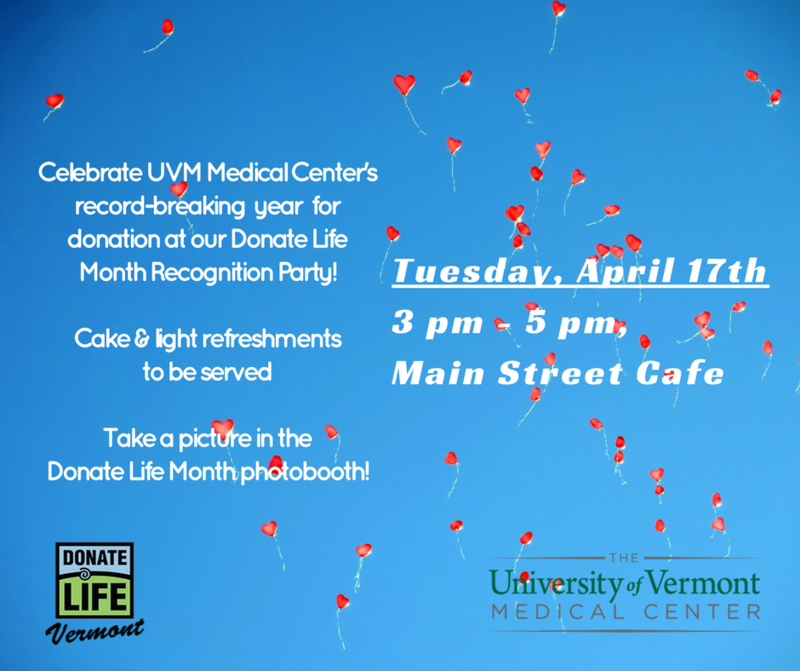 To celebrate this record year we are hosting a Donate Life Month Recognition Party on Tuesday, April 17th from 3 – 5 pm in the Main Street Cafe at UVM Medical Center! There will be cake, a blue and green photo booth and a chance to mingle with all of the incredible organ and tissue donation advocates in the hospital and the community. The party is open to the public and all are welcome, but we encourage community members to RSVP! Please RSVP to Kevin Kehoe, UVM Medical Center’s Clinical Donation Specialist at kevin.kehoe@uvmhealth.org.